After his schooling at Brienne, the young Bonaparte went to the Paris Ecole Militaire military school from 22nd October 1784 to 28th October 1785. He left as a second class lieutenant in the artillery, with a commission to join the La Fère regiment in Valence. In 1795 Bonaparte came back to the school to establish there his command headquarters, the school having been closed in 1787. From 1799 onwards the building was used as a barracks for the Consular Guard and subsequently the Imperial Guard. The idea to found a military academy for young gentlemen without means was first voiced in the Spring of 1750 by the Marquise de Pompadour and the financier Pâris-Duverney. Louis XV signed the edict creating the new school on 13 January 1751, and the building was to be sited near the Invalides. Jacques-Ange Gabriel was commissioned as the architect. Although aspiring to create a noble edifice which would outshine the Invalides, Gabriel was forced, because of wars and financial difficulties, continuously to downscale his plans. And despite the fact that the first pupils arrived in the annexed buildings in 1756, Gabriel's plans were not approved by Choiseul, the minister of war, until ten years later in 1766. The land forming the Champs-de-Mars, reaching down to the Seine, had been reserved as vegetable gardens, began to be used during the same period by the pupils at the school for military manoeuvres. And so Gabriel decided to orientate the façade towards this land, whilst the chapel, for reasons of economy, was integrated into the central pavilion of the building, called the 'château'. This first part of the construction was completed in 1773. A porch with eight Corinthian columns supports a pediment and pavilion dome, in which is set a Lepaute clock. Four statues stand on the entablature: Victory (with the features of Louis XV), France, Peace and Power. These very badly damaged figures by the sculptors Huez and Mouchy are today housed under the porticoes in the cour d'honneur. The two lower sides of the corps-de-logis, either side of, and framing, the central pavilion, are the work of Brongniart, the architect who took over from Gabriel. The corner pavilions bearing the inscriptions 'Cavalry' and 'Artillery' were added under the Second Empire. The façade over the cour d'honneur (photo above) is framed by two elegant Doric porticoes. The central pavilion mirrors the schema of the exterior façade: fluted Corinthian columns on the colossal Order supporting a pediment above which rises the same pavilion dome. The pavilion itself is linked by a double colonnade (Doric on the ground floor and Ionic on the first floor) to two corner pavilions. 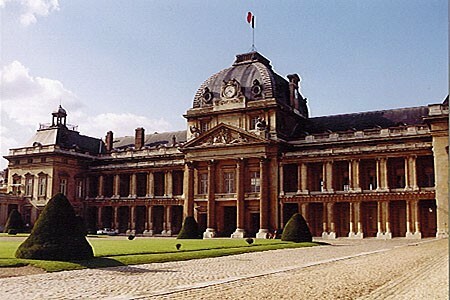 The large Morland courtyard which faces the cour d'honneur is still today a cavalry exercise ground – indeed ever since its foundation the Ecole Militaire has been a centre for excellence in French horsemanship. The school courtyards – named after Westel, Garnier, Desjardins, Coquelin de l'Isle, Bernard and Morland, all soldiers and officers of the Grande Armée – are all evocative of the Napoleonic epic. Further courtyards bear names even more famous, namely Berthier and Roederer. Two of the chapels can be visited. The chapel known as the Pupils' Chapel is today the officers' mess, and the main chapel, with its light composition of Corinthian columns and nine paintings of the life of Saint-Louis, is a masterpiece of Louis XVI style. During the Empire this chapel was used as a ballroom and on one notable occasion the Emperor's birthday celebrations (organised by Bessières) were held there. The great formal staircase and salon des Maréchaux are not open to the public. On the other hand, the library of DEMSAT (the Army Education department) is open to all. Here visitors can admire period woodwork and paintings as well as a marble fireplace bearing representations of two cadets in their uniforms. Exhibitions of rare and ancient books are frequently organised. Hence in 1998, Egypt Year, there were exhibitions here on the Egyptian and Syrian campaigns and restaurations were undertaken on the theme of the Description of Egypt. Today the Ecole Militaire is the headquarters for French military education. The history of the Champs-de-Mars is closely linked to that of the Ecole Militaire. It was used first of all as an exercise yard for the pupils and it could hold ten thousand men in battle order. A painting by Hubert Robert, La fête de la Fédération gives a good idea of what the parade ground looked like at the end of the 18th century – namely, flat, surrounded by bricked ditches closed off with gratings; it was furthermore much larger than its present dimensions. The same painting also reveals the main purpose for the Champs-de-Mars during the Revolution, namely one of a place for major Republican festivals, such as the Fête de la Fédération, 14, July 1790 and the Fête de l'Etre suprême, 8 June 1784. The place was also the site of the first 'aerostat' tests in 1783 as well as hosting the exhibition of industrial produce in 1798. Many of the great military celebrations of the First Empire were held on the Champs-de-Mars, notably the distribution of 'Aigles', 5 December 1805 and the Ceremony of the Champ de Mai, 1 June 1815. Starting in 1780, horse races were held here, and this continued up to the creation of the Longchamp racecourse in 1857. Indeed the horse race known as the Prix de l'Horloge takes its name from the clock or Horloge which towers over the Champs-de-Mars in the dome of the Ecole Militaire. The Champs-de-Mars also hosted parts of the Universal Exhibitions of the 19th century (1867, 1878, 1889 and 1900) before being transformed into a park in 1908 until 1928 when its size was considerably reduced by the building of the residential avenues Charles Floquet and Emile-Deschanel.